1) Can you think of times when sowing to please your “flesh” (your sinful nature) forced you to reap “destruction”? 2) How do these verses motivate you to “do good to all people”? 3) What we boast in is what we are living for. What do you celebrate (boast about) most? What does that say about what you may be living for? 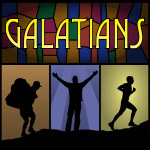 4) Going deeper: If you had to sum up the message of the whole book of Galatians in a few words, what would you say?